Will 50,000 People Like Oreo Cookies Today? Probably so. The beloved calorie king is taking a run at the Guinness World Record for most “Likes” to a Facebook post in 24 hours. The Social Media guy in me wishes I had thunk it. My prediction: a World Record race will ensue as other lovable consumer brands draft off the idea. Old Spice? Red Bull? 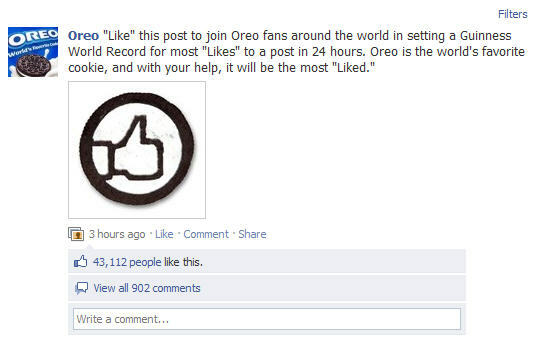 As of 12:30 p.m. EST they had amassed over 43,000 “Likes.” Have you “Liked” Oreo today? Will you? Thx to @applegirl for the heads-up. Previous Previous post: How Much Are Your Words Worth?